Unseasonal weather disturbances in recent years have become a phenomenon, which has affected food security and livelihoods of people across the country. The recent heavy rainfall in North India have not just elongated the winter months for the people, but have adversely affected the farming community. Farmers across North India have suffered profound loss to their Rabi crops, which are harvested in the month of April and were in their last stage of formation/development. Light winter showers can be good for the Rabi crop, but normally they do not need rainfall. The unexpected rainfall in the month of March was exceptionally strong and was accompanied with very heavy wind at the speed of up to 10-15kms per hour and hailstorm. 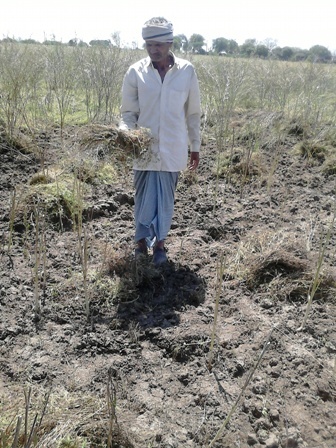 This caused heavy damage to the standing Rabi crops in Bundelkhand. According to the Indian Metrological Department information, on an average the various districts of Bundelkhand receive 6mm of rain in the winter months. 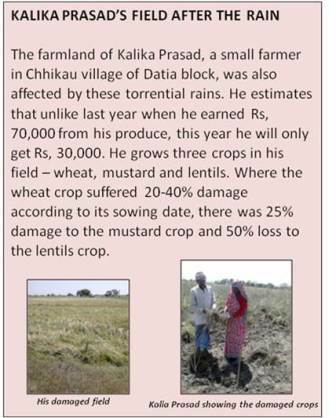 The Krishi Vigyan Kendra of Datia, Tikamgarh and Jhansi district reported that Bundelkhand recorded 24.6mm of rainfall during 28th Feb – 2nd March and 18mm rainfall during 14th – 15th March 2015, which is not normal. In many cases there were reports of water logging in the fields and in other cases the produce was flattened due to the strong winds. This has adversely affected the wheat, pulses and oilseed produce in the region. 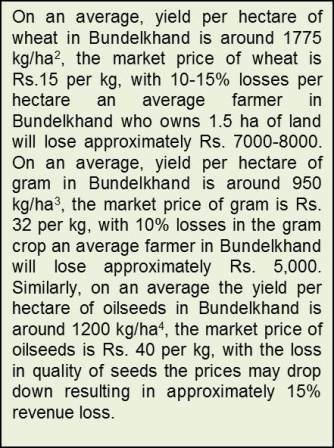 There has been an approximately 10-15% loss per hectare (ha) in the wheat produce, around 10% loss per ha in the gram (pulses) crop and 50% loss per ha in the quality of oilseed crop. Apart from losing crops which were almost ready for harvest, the heavy wind and rains have also reduced quality of the produce bringing more misery to the farmers. The farmers have not only lost income from the destroyed crops, but will also earn less than normal market price for the remainder of the crops. Farming is the primary source of livelihood for maximum people in Bundelkhand with an average monthly salary of Rs 3,000-4,000, the unseasonal rainfall has caused a situation of economic crisis for the farmers here. Even though efforts were made like issuing pre-warning SMS alerts to all farmers, but as the produce was still not ready for harvest, the farmers could neither harvest their crops earlier than the scheduled harvest time, nor were they aware of any other option of protecting their crops. While keeping in mind these unexpected climatic conditions and their grave negative impacts on the rural economy, we need to contemplate on what can be an efficient solution to mitigate such problems. In order to minimise the impacts of such unseasonal weather conditions on the food and livelihood security of farmers, risk compensation through crop insurance is a promising alternative. National insurance schemes such as National Agriculture Insurance Scheme supports the farmers to get their crops insured against unseasonal weather conditions. However, awareness about such alternatives is largely lacking at the grassroots level. Lack of information on such compensatory options amongst the most vulnerable farming communities pushes them away from mitigating the impacts of climate variable on agriculture. To further warn farmers against the vagaries of climate related impacts, the Indian Meteorological Department (IMD) of the Government of India in collaboration with leading agricultural institutes in the country, provides Integrated Agro met Advisory Services (IAAS). Bulletins are issued at national, state and district levels. At the district level, bulletins provided by the agro met field units give advisory information on crop management consisting of standard agronomic management practices under normal weather conditions and suitably modified agronomic management practices under forecast of transient weather conditions. This assists the farmers in taking appropriate farm related decisions.